Microprocessors can now see the light. 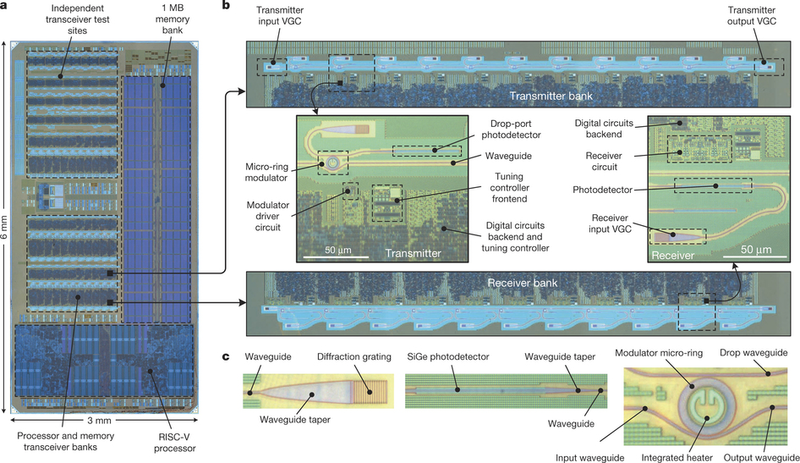 A multi-university research team has combined electronics and photonics, putting 70 million transistors and 850 optical modulators, filters, photodetectors, and couplers on to a single 3mm x 6mm chip. The disparate technologies are integrated with each other, and communicate via light with the outside world. This is a long-awaited and much-needed breakthrough. Chip electronics are fast approaching electrical and thermal limitations (current leakage, crosstalk interference and heat build-up). Before long, electronics alone will not be enough to build more powerful microprocessors. Optical components do not suffer from the problems that plague electronics, but putting them on silicon is not without its challenges, because silicon does not transmit optical signals nearly as well as glass. The team also includes fellow UC Berkeley professor Krste Asanović, Rajeev Ram at the Massachusetts Institute of Technology, and Miloš Popović at the University of Colorado, Boulder. “This is the first time we’ve put a system together at such scale, and have it do something useful, like run a program,” adds Asanović, who designed the instruction set architecture (RISC-V). But the research team didn’t just design the first-ever electronic-photonic chip system. They circumvented custom manufacturing processes, designing on-chip photonic components to be fabricated using standard microprocessor foundry technology. The above slide shows the die photo of the 3 mm by 6 mm chip with the processor, memory, and transceiver banks called out (a). The processor transmitter and receiver banks (identical optics) with close-ups of the individual transmitter and receiver sites (b). The lower right images are micrographs of the grating coupler, photodetector, and micro-ring modulator (c). One of the team’s key innovations was getting optical signals to move though silicon with minimal loss. “The researchers used the silicon body of the transistor as a waveguide for the light,” says the press release. “They did this by using available masks in the fabrication process to manipulate doping, which is the process used to form different parts of transistors,” it states. Next, the team managed to modulate the optical signal. “They designed a silicon ring with p-n doped junction spokes next to the silicon waveguide to enable fast and low-energy modulation of light,” explains Stojanović. They also used existing silicon-germanium processes to build a photodetector, using germanium’s ability to absorb light and convert it to electricity. The last hurdle was talking to the outside world using optical signals. The research team built a vertical grating coupler using the chip’s existing poly-silicon and silicon layers. The above schematic depicts the researcher’s test bed (YouTube video). Identical chips were used. One acting as the microprocessor (left side) and the other as the remote 1 MB memory bank (right side). 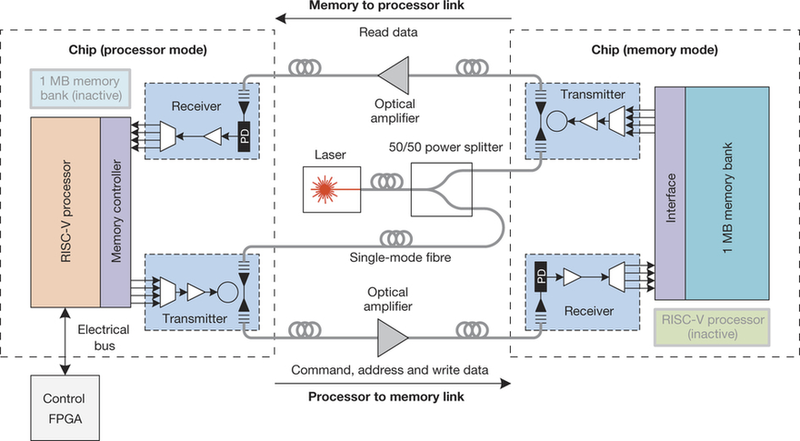 In the middle of the schematic is the laser power source that provided unmodulated light to the optical transmitters in each chip. 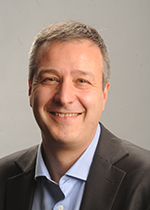 When asked what’s next for the research team, Stojanović said it will be commercialized by an outfit called Ayar Labs, and ultimately ported into bulk CMOS. The team is not done researching either. “From a systems perspective, we’re starting to look at how this photonic interconnect can help change the switching architecture of the data center, not just get more bandwidth and less energy per existing link,” he explained. It should also help data centers go green. “Since moving data in the optical domain takes less power, and large data centers host thousands, maybe tens of thousands of servers, it is easy to see how this development could save a lot of money on the electric bill,” says Losio. If he’s right, the future looks bright for electronic-photonic chip systems.